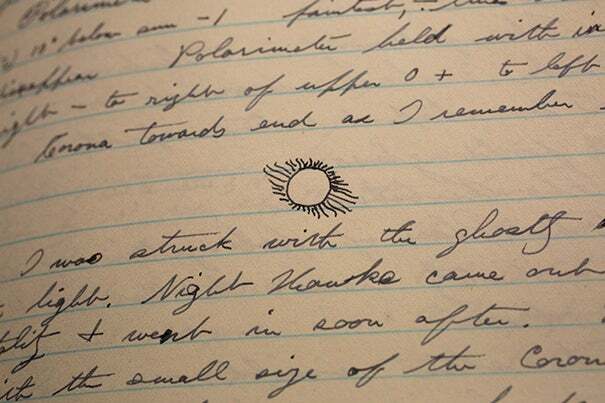 The Wolbach Library is putting together an exhibition of Harvard's observations of eclipses since the 19th century, including the papers (pictured) of George Phillips Bond, Harvard Observatory director from 1859 to 1865. Eclipses like the one coming Monday have mystified and intrigued humans for millennia. They also fascinate Harvard researchers, who have long studied them to better understand the workings of the sun and the solar system. In the early years of Harvard College, founded in 1636, most astronomical work occurred in the math department. That changed in 1839, when William Cranch Bond was hired as the “Astronomical Observer to the University.” His arrival led to founding the Harvard College Observatory, which might not have happened if not for an eclipse. Bond viewed his first solar eclipse when he was 17 years old, and the experience jump-started his interest in astronomy. Since its inception, the observatory has dispatched expeditions into the path of total solar eclipses to study the sun’s corona and the inner solar system. Armed with telescopes, notebooks, cameras, and various bulky, eccentric experimental devices, the scientists have set out to understand a fundamental cosmic beauty. A team of Harvard scientists will be stationed in Kentucky for Monday’s much-anticipated total solar eclipse. The first solar-eclipse expedition was to Lilla Edet, Sweden, in 1851. George Phillips Bond, son of William Cranch Bond and the observatory’s second director, was nearly clouded out. Disheartened, he had given up on observations until an hour before the event began. The clouds broke just in time, and Bond witnessed majesty. He sketched two diagrams of totality, coloring the “rosy prominences” that entranced him. “Language is utterly powerless … I cannot picture a sight more awfully glorious on this side of heaven,” Bond wrote of the experience. These were rudimentary years for science. Bond had traveled to the site alone, and had borrowed his only telescope from a local observatory. But as the physical sciences grew in sophistication and researchers came to appreciate the potential of photography as a recording tool, scientists launched expeditions more often and with more complexity, taking with them cameras and scientific instruments. 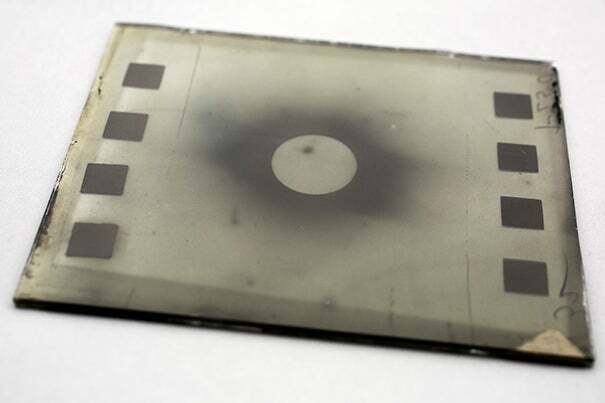 The partial eclipse of 1851 was recorded at the observatory in Cambridge by daguerreotypist John Adams Whipple. Such early photography was not a simple process. The participating astronomers and photographers all had jobs in the process: whether watching the boundaries of the sun for moments of contact, calling out the time, preparing photographic mirrors, exposing them to the image, or speeding them off for developing. These early eclipse photographers did not aim to represent the beauty of an eclipse, but to capture the image so scientists could parse the event’s details afterward. 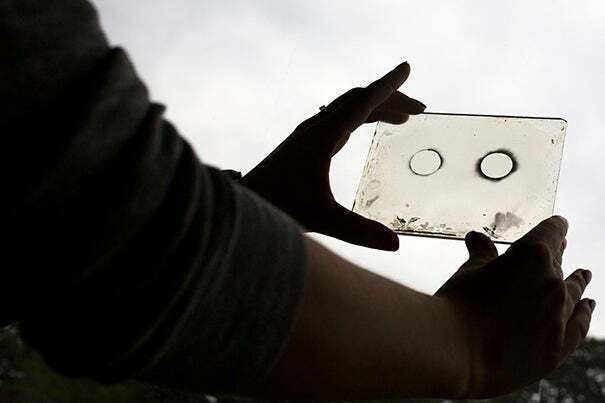 In 1869, Harvard sent a team to Shelbyville, Ky., to record a solar eclipse on a sequence of glass plates. The images of totality were striking, but not entirely satisfying. When William Pickering, an astronomer who worked at the Harvard College Observatory, later studied the images in preparation for an 1886 expedition, he described the corona as “flat” and wanted to better capture its wispy grandeur. With some adjustments to his instruments and methods, he was able to capture a stronger image in Willows, Calif., in 1889. As the capabilities of photography expanded, so too did the complexity and variety of instruments that were brought on expeditions. Each telescope and each camera needed an operator during the fleeting phenomenon. That made for large teams, usually 15 to 20 people. Their camps often took at least three days to establish and rig, becoming curiosities in local communities. Residents would gather around in crowds to chat or hear public lectures or to catch a glimpse of science in action. 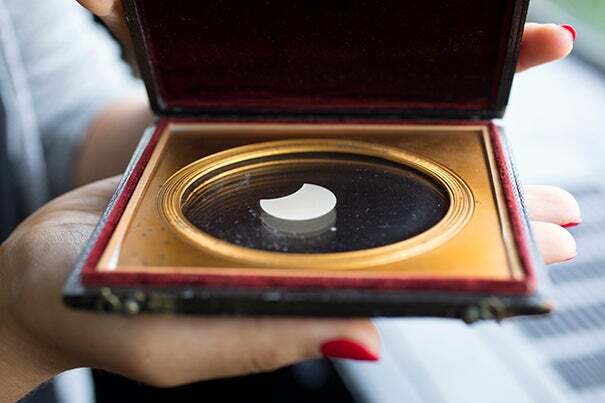 For the upcoming eclipse, as a century ago, Harvard scientists will be stationed along the path of totality to observe and study the sun, with one team observing it from a Gulfstream aircraft at 50,000 feet over Kentucky. The instruments and circumstances change, but the hunt for knowledge continues. 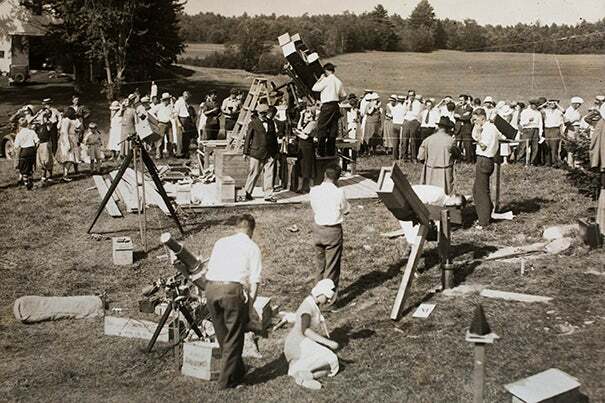 To read more about the history of Harvard College Observatory solar eclipse expeditions, click here. An Asian green mussel’s foot probes the surface, evaluating whether it can attach byssal threads. The Wyss' SLIPS technology disrupts this process, confusing its senses and forcing it to move on.